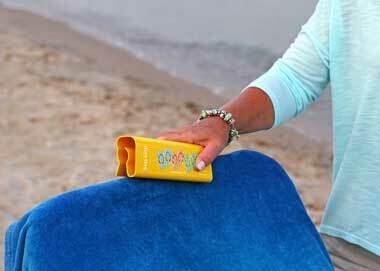 Slip Clip – The Perfect Beach Towel and Everything Clip! Never let your beach towel fall again! The Slip Clip is a new and exciting all-purpose clip created by Julie Wasco and manufactured in Grand Rapids Michigan. The Slip Clip can hold towels onto beach chairs, towels, clothes and bags onto boats, purses onto rolling luggage or walkers, purses onto chairs, keeps books open while reading so pages stay in place. The Slip Clip is great for camping too! Use a Slip Clip to hang wet towels and clothing on the camper poles. The Slip Clip is great for outdoor BBQ’s – keep that table cloth in place on a windy day with a Slip Clip. The Slip Clip is the perfect everything clip! The Slip Clip won’t break and it is easy to use. The Slip Clips measure 6″ and are made with flexible plastic to fit different chairs, boat rails, kitchen handles, books and much more. They hold bags, clothing, towels and table cloths to boats, campers, walkers and tables. And so much more! The Slip Clips come in a package of 2 and are available in green and white with surf boards, blue and yellow with flip flops, and yellow with Hawaiian flowers. 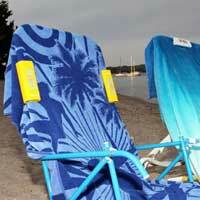 Attach beach towel to a lounge chair with a Slip Clip! 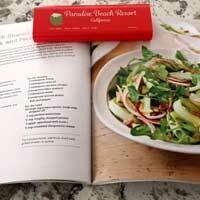 Keep pages in place with a Slip Clip! 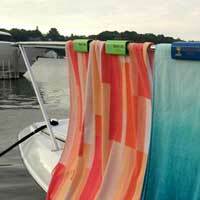 Attach beach towels on boat rails with a Slip Clip! Keep your hands free! 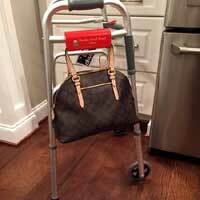 Attach your bag to your walker with a Slip Clip.